Of course, having converted the vehicle, you then have to fill it up. If, like me, you are lucky to have a local filling station then you’ve no problem - but of course, going back a few years there were large areas with no facilities at all. When I converted my Discovery, I had a filling station down in town, but I felt they were ‘a tad pricey’ ! Quite by chance, one day I met another Land Rover owner filling up with gas and got talking ... only to find that he had a hand pump that he’d made. A quick ring round revealed that I could make significant savings by buying large red industrial cylinders - which you can do legally (but see here for the legal stuff). I had arranged to borrow this hand pump and gave it a go - it wasn’t very successful ! However, I identified the problems with his pump - and dealt with it by removing the springs from some of the non-return valves. As he didn’t want to sell it, I set about making my own. 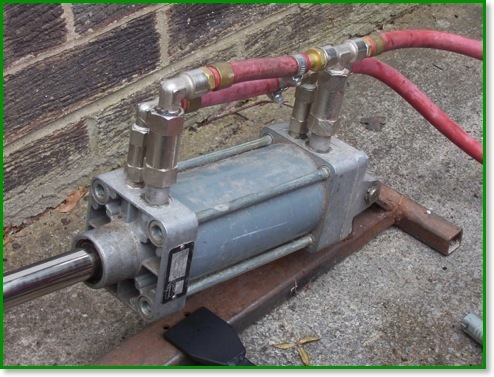 Of course, five years later the likes of eBay are full of LPG pumps of all sorts, mostly ‘budget’ electric ones.